A beautiful and stylish house: spacious rooms, high ceilings, visible beams. Grand central patio with large dining table and garden area. Beautiful terrace on the roof, large table and deck chairs. Clear view. Piano. This is a large and rather quirky house, well equipped and very comfortable. We had a couple of problems during our stay with the electrical supply....not the owners fault...these were dealt with quickly and did not effect our stay. Antonia, the owners local representative, was very helpful and kind. Would recommend this house if you want something different from the usual complex Villa or apartment. Sanlucar is well positioned for visits to the coast, Cadiz, Jerez and Seville. It is a lovely historical town with plenty of good restaurants. The accommodation was wonderful. It was spacious, clean and had a great old Spanish flavor. It was close to a central plaza, a winery and an old castle. I would recommend this to anyone wishing to taste the flavor of Spain. "a wonderful property.great for a large group.smack in the middle of the "real spain".life on the roof was great.5 minute walk to the town center.everything you could want." "We enjoyed our stay at this lovely and spacious home. Sanlucar has a lot to offer and we enjoyed exploring the town as well as doing some hiking and visiting Donana park. There is lots of room at this house and it is well appointed." 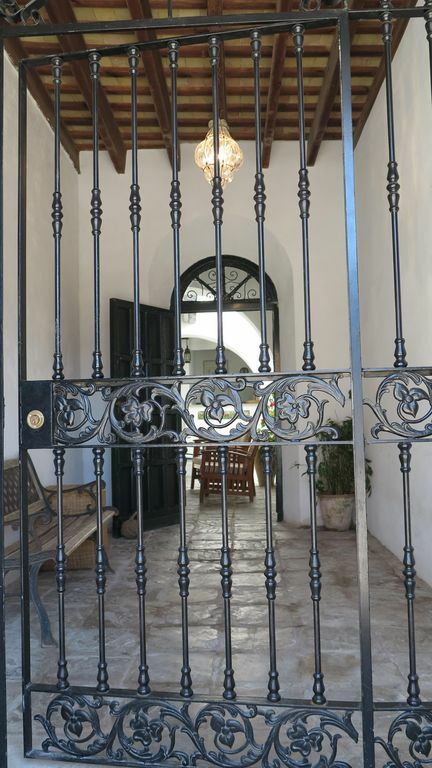 "A nice old traditional Spanish house with thick walls. It could hold a very large group of people. The house would probably be nice and cool in the summer, but it was also cold as a tomb in the winter - difficult to keep more than three rooms warm. The town has some nice features, but is pretty run down in places. Graffiti outside and a public school across the street didn't bother us. Owner and agent are both great." "A BEAUTIFUL HOUSE IN A CHARMING OLD TOWN.VERY ROOMY AND WELL EQUIPPED.SPOTLESSLY CLEAN AND NEAR VARIOUS BARS AND RESTAURANTS.THE SQUARE IN THE TOWN IS FULL OF LOVELY BARS AND RESTAURANTS ALSO SO THERE IS NO SHORTAGE OF PLACES TO EAT.WE HAVE BEEN TO SANLUCAR MANY TIMES NOW AND WE WILL DEFINITELY BE RETURNING AGAIN"
In the surrounding area there is an abundance of golfing greens and equestrian centres, as well as nearby towns and villages of great artistic and historic interest, of which: Jerez de la Frontera, El Puerto de santa maria, Cadix, Arcos de la Frontera, Medina Sidonia, Vejer…This beautiful region has many spectacular sites to be discovered. Whether along the white villages roads, or the coast near to Gibraltar from which the African coast can be seen on the horizon, innumerous excursions are possible.Wide choice of quality restaurants and bistrots. Local cuisine famous for excellent seafood (list with addresses on piano).